On this day, in the midst of World War I, the House passed a constitutional amendment granting women the right to vote by a count of 274 to 136. 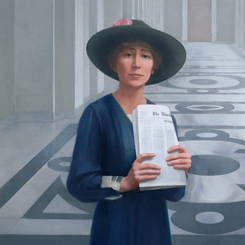 Representative Jeannette Rankin of Montana who, a year earlier, had become the first woman to serve in Congress, implored her colleagues to support the legislation: “How shall we answer their challenge, gentlemen: how shall we explain to them the meaning of democracy if the same Congress that voted for war to make the world safe for democracy refuses to give this small measure of democracy to the women of our country?” The Senate, however, failed to pass the amendment in the 65th Congress (1917–1919), so the measure was once again reintroduced in the House in the 66th Congress (1919–1921), passing on May 21, 1919, by a vote of 304 to 90. The Senate concurred shortly afterward. The 19th Amendment then went to the states, where it was finally ratified in August 1920. Test your knowledge of women who served in Congress with this fact sheet. Jeannette Rankin, Mary Norton, and Shirley Chisholm are a few of the women Members who made history in the House.